Once an artist has released a few albums of pure gold, those albums that get an easy 100 plays, they have a nasty habit of plummeting downhill faster than Bode Miller on PCP. Very few bands manage to keep up a level of quality that sets them apart from their peers, and almost all disappear back into the gloom and mire and a possible 2015 reunion tour, remembered by a few loyal fans and few others. The first sign is normally an album that just seems listless, lifeless, lacking in energy and vim and verve and other lively whatnots. Item 1, for the jury’s deliberation, is M Ward’s “Hold Time”. The second sign is a whole load of guest appearances, “superband” recordings and the like. Item 2, “She And Him” and “Monsters Of Folk”. Do you need me to go on? 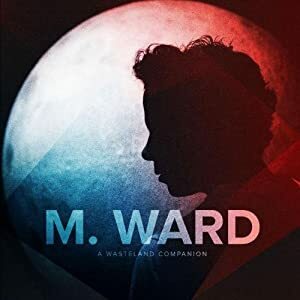 So it was a great surprise and shock to me when I first listened to M Ward’s “A Wasteland Companion”1. First off, there was the opener, “Clean Slate”. Starting off with that wonderfully dextrous, woody guitar that he can apparently toss off in his sleep, followed by his wonderfully warm, woody voice, I had an inkling that I was in safer hands than his last effort. Then lead single “Primitive Girl” came along, all glam-rock-gone-Americana stomp, initially feeling somewhat thrown off, but with the payoff lines “That primitive girl, she don’t need me” telling me there was more to the song than met the eye. Song by song tumbled past, each making me think that there was something good happening. “The First Time I Ran Away” with its charming ease. The rollicking rockabilly of “I Get Ideas”, a song that he’s managed to cover not once but twice in entirely different ways. The way that he’d finally managed to make Zooey Deschanel sound not utterly irritating on “Sweetheart”. And the fact that after a whole bunch of albums on which he’s been unable to find a decent song to end on, he’d found four on “A Wasteland Companion”, from “There’s A Key” right through to “Pure Joy”. And two live shows during the year helped cement my feelings about this record. First off, supporting Feist, made me pleased that so many people seemed to be there to see him, though I can only vaguely remember “I Get Ideas”. But a headline show at a sold-out Koko gave me great, great joy; a man clearly loving what he does, and starting now to reach out to his audience and talk to us, talk to us I say! And that gig made me think that yes, this record was great. Maybe not quite up there with Transistor Radio, or Post-War, but great enough. 1 Now I’m sure I’m being stupid here, but is this solely named after Fallout? Not some Henry David Thoreau essay? Buy “A Wasteland Companion” (CD/MP3). Still under a fiver!